Holy mother that is one hot necklace. The dress is of course beautiful, but I must say, the necklace MAKES IT. I am a bit in love with teal/emerald this summer, and wish I had a reason to indulge in a dress like this (anyone else think it would make a FAB bridesmaids dress?)! This necklace totally steals the show of this outfit (which is a bit too eclectic for my personal wardrobe, but totally within my taste. Although, I am thinking it could look a bit 80's prom dress if you take away the necklace...?). I am spotting Thai silver and genuine gemstones on this beautifully and culturally styled piece. And who else recognized the model from America's Next Top Model, Cycle 9 contestant, Biannca Golden? This one isn't just some necklace on top of a dress - it's part of the dress! I will admit, I have been collecting big, bold wooden beads in hopes that one day I will have the time and courage to attempt to make a halter with the beads as the straps. I'll get to it, ya know, when I have 36 hours in a day and endless energy and creative gusto (right, one of THOSE projects!). It's no surprise that Korto's jewelry was as big of a hit on the runway as her clothing itself. Of the experience, she says, "I get a lot compliments on my jewelry and handbags and it's actually something that started as a hobby. I took this jewelry class here and I started making earrings for myself and so many people asked about them, so I decided to start making them to sell and that kind of took off like that. I didn't want jewelry in my collection that looked generic. I wanted to use African beads, I also used Thai silver... I felt it really represented who I was as a designer. The judges weren't all the way impressed with it but I stood by my jewelry and I put them on those models and I figured somebody out there would love it. You just have to do what you want in the final, that's your one chance to do and if you hold back you will always regret it. I spent a lot of time making that jewelry so I wasn't going to not put it in just because the judges didn't like it and I'm glad a lot of people took to it so that tells me that the people who matter will buy it." (see the full interview here). Korto has thus added jewelry design to her collection, and is selling lots of it online. But, I am finding myself torn on her online collection. On one hand, I am super proud that she is insightful enough to see that her jewelry collection was a big enough hit to warrant it's own line, but the stuff for sale on her website isn't really as amazing as her jewelry as featured on her final runway show, or even my favorite Project Runway source, ProjectRungay. (The one on the right is one of the better pieces from her collection that actually resembles what she made before, but I feel that the rest of them miss the mark. Check them out here). The following pieces, however, were showcased in an interview with Korto. One word: breathless. Of her work, Korto told Zimbio: Inspiration: "I tried to do a follow-up on the few pieces that I got to show at Fashion Week. They’re very much Asian and African inspired and it’s a fusion between these two ethnic cultural backgrounds that I really love. I found myself always doing things that are Asian inspired." Colors: "I used a lot of the bright colors that I love to use. The ocean greens, really beautiful yellows, purples, and hot fuchsia pinks. Very vivid colors, fun colors, happy colors…those are the colors I really love." 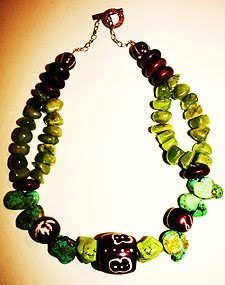 Materials: "I use a lot of African beads as well as a lot of things made out of resin because my necklaces tend to be chunky and bulky, so I try to use materials that are not as heavy as using the actual stones and metals. A lot of glass beads. Some of the beads are from Ghana, Kenya, and Tanzania. I love texture, there’s a lot of texture, my variation of textures, in all the pieces. I love turquoise. I also used feathers in some of the designs, I’ve always loved feathers and there are many different variations of feather earrings, so I thought “How can I make mine different?” I like the chains and the feathers. It has a soft and a hard feel to it. They’re made out of silver." So, who wants to go on a trip to Kenya with yours truely to buy some African beads? Anyone, anyone? I love Korto! She was one of my all time favorite designers on the show. I cannot wait for it to come back on. Thanks for posting this! The one thing I've always appreciated about African fashion is the use of bold color. I think shopping for beads there would be amazing. And I bet you'd meet some pretty remarkable people in the process! Korto found the link to this entry I posted on Facebook and "liked" it - then she accepted my friend request!!! Wow, I love every piece! They're gorgeous, big and colourful, just my style! The african american girl has a very nice jewelry! We dont have same as this on your site here in Thailand. We have simple things about a Buddhist nature. I am Buddhist also - my name is Joy. I live in the south of Thailand but I was born in Sisaket of the north east. Do you know this countryside place? If you come to Thailand someday you can visit us in southern Thailand - we have a small Thai Buddhist jewelry shop where we sell Buddha and other Buddhist pendants, bracelets, yant cloths and things that Buddhists like. Maybe you would like it too? I love her style and flavor my sister from West Africa. I also love Rihanna style.Continue your great work and you should consider to open a line of women clothes. I totally didn't realize that was Bianca! Good eye :) Korto's clothes I like a great deal, but I admit that her jewelry's a bit too chunky for my taste. That said, I think that the pieces look *awesome* on a runway where it's key to be seen from every spot in the crowd. Jewelry is an accessory that enhances the beauty and appearance of a woman. Handmade Jewelry has universal appeal and great importance because it is created with care by human hands. Above hand made jewelry is looking awesome.